The state of New York is penalizing texting and driving, but most are forgetting the state has stricter laws for those who wish to drive under the influence of alcohol. The state has claimed over 1/3 of fatalities are involved with intoxicated drivers and even pedestrians. With drivers under the age of 25, the amount of fatalities increases three times! This leaves the state with no other option but to raise the bar for high risk drivers when convicted of a DUI/DWI. If you reside in New York you may assume the level to get a DUI is .08 BAC or blood alcohol level, however, there are penalties for driving with a BAC from .05 to .07. If you are caught driving under the influence with a BAC of .18 or higher the consequences are stiff. According to the Century Council and Mothers Against Drunk Driving there were 315 fatalities involving drivers impaired while driving in 2011 in New York. While the numbers seem small the actual number of drivers driving under the influence of either a drug or any amount of alcohol can reach 1 in 5 drivers in the state of New York (according to Static Brain). The number of arrests in the state was over 25,000 in the year 2011. If you are a safe driver in New York you want to be aware of the consistent issue with drivers driving under the influence. From the year 2001 to 2011 the number of fatalities has decreased while the number of arrests has increased over the same 10 year period. It appears no matter the consequence drivers are going to continue to drive under the influence which puts safe drivers at risk and increases their insurance rates. If you are driving under the influence, based on statistics, most people will drive drunk over 500 times before getting caught by the police or law enforcement. 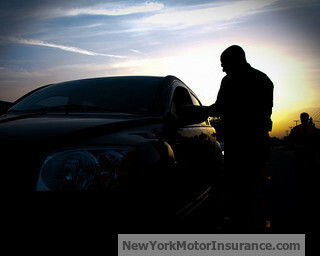 No matter how cautious you are the odds are you are going to have to pay a hefty fine and driving penalty in the state of New York. As stated before, there are penalties for driving with a BAC of .05 which for most people is only two drinks. Most importantly, if you are above the legal limit you are not immune from law enforcement. Look at the recent news of Dina Lohan (Lindsey Lohan’s Mom), who was recently arrested in the state of New York for a DUI. Unfortunately for safe drivers who obey the law, all of the arrests and/or claims from DUIs or accidents resulting from them, raise your insurance rates. Since the number of claims have increased over a certain period, say a year, the insurer files with the state to increase your insurance rates to cover the cost of increased claims from DUI’s fatalities. The good news is you still have control over your own driving habits and there are available programs for drivers to mitigate any increase in premiums.